I'm not going to give you a history lesson on Tommy Keene's back story. Any idiot can search Google and come up with the same information. But Keene has been making music on his own for quite some time now, and with fantastic results. "Power pop" is too limiting to describe his music, there's so much going on in any one song, or album to album. His new record In the Late Bright is another stellar record from a career that already has so many highlights. I was able to ask Tommy a few questions during his most recent tour. Don't hesitate to catch him live if you can. I promise you will be blown away. Scene Point Blank: How did the recording atmosphere of In The Late Bright differ from previous records? Tommy Keene: Actually, very similar to the last record, drums recorded at home, as was everything else except Walt Vincent played his parts at his studio, then mixed five songs. Jon Pines also mixed five songs at his place in Illinois. I mixed "Elevated" at home. Scene Point Blank: Why did you decide to handle most of the instruments on this album yourself, including bass? Tommy Keene: Convenience really, Brad Quinn did play bass on one track and Walt handled the bass on another. Scene Point Blank: Did you approach crafting these new songs any differently this time around? Tommy Keene: With the exception of "Elevated", no. That was one of the first songs attempted and was going to be a template of sorts for a whole record but then as usual I got caught up in rock and pop melodic songs. The next album, if there will be one, will be more like "Elevated" all around. Scene Point Blank: What has been the audience's reaction to the new songs on this tour? Tommy Keene: Pretty good I think. The funny thing is you always get requests for the ones off the new record that you haven't worked in to the live set. Scene Point Blank: Are you planning on more touring to support this record after this first leg is done? Tommy Keene: No, unfortunately not. Scene Point Blank: There were plans for a retrospective DVD of your career that was shelved. Any plans to revisit this for release? Tommy Keene: It's an ongoing project, just trying to get all the pieces together. Scene Point Blank: Looking back at the Keene Brothers project, are there any plans for a sequel? Tommy Keene: No not at this time, it's up to Bob really and he has lots of different projects going on. Scene Point Blank: How was the Boston Spaceships tour? Was it any different than touring with Robert Pollard solo? Tommy Keene: We were playing smaller venues and it was a different band but still the same Bob tour vibe. Scene Point Blank: You recently finished some touring with Sally Crewe as a bassist. What sparked your participation? Tommy Keene: I've become friends with her, the idea of playing bass live interested me, I like her songs etc. Scene Point Blank: What new music is getting a lot of play from you lately? Tommy Keene: I haven't bought too many new records lately, so revisiting the classics always works in the meantime. Plus a lot of new Bob Pollard records that he sends me. Scene Point Blank: Any other media like books, art, or movies that influence your songwriting subject matter? Tommy Keene: Well always but I'm not in a writing mode right now. Scene Point Blank: What is the most annoying thing about living in L.A.? Tommy Keene: Leaf blowers going 365 days a year. Scene Point Blank: With so many musicians in the area, do any all-star late night jams ever happen? 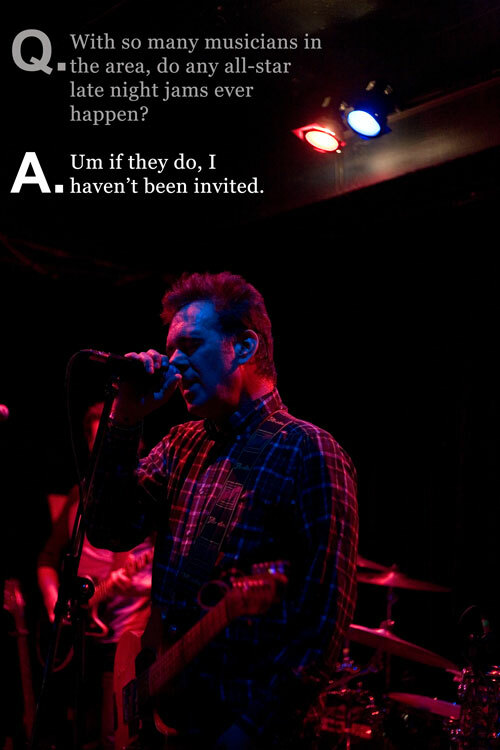 Tommy Keene: Um if they do, I haven't been invited. Scene Point Blank: What's the best concert you have attended recently? Tommy Keene: My last one. Scene Point Blank: Any reunions by long gone bands that you would like to see happen? 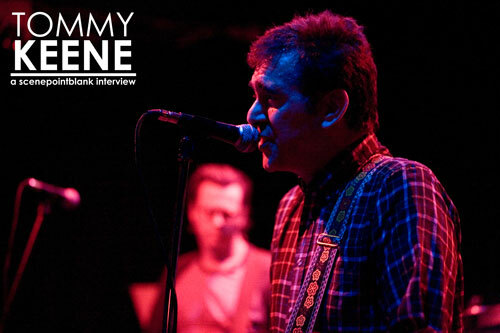 Tommy Keene: Reunions don't really do it for me, especially if I saw the band in their prime. I suppose seeing Mott the Hoople this fall in London would be cool, but I saw them in 1973, the last show that Mick Ralphs ever did with them, which was amazing so I'll leave it at that. Scene Point Blank: Speaking of reunions, any chance of a Blue Steel reunion this year? Scene Point Blank: Can you speak briefly on the band you had with Frankie LaRocka? Tommy Keene: I was playing with a girl in New York at the time with a bass player named Kenny Aaronson, he knew Frank, who knew a singer named Matt. We did about eight shows and were offered one record deal that was deemed too cheap. Frank was a fun guy, I was very sorry to hear that he had passed some years ago. I remember sleeping on his couch in his Staten Island apartment for many months. Scene Point Blank: What do you like to do for fun when you are not playing guitar? Tommy Keene: I love to cook, imbibe and play pool. Scene Point Blank: Next releases for you would be what-another live record, maybe an acoustic effort? Tommy Keene: We're working on a two disc best of Tommy Keene release for next year, but it's going to be a hassle getting the rights for the Geffen songs, fingers crossed!!!! Scene Point Blank: Thanks very much for your time. Words by Sean K. on Oct. 16, 2010, 11:05 a.m.
Posted by Sean K. on Oct. 16, 2010, 11:05 a.m.